When you hear the words rock concert, the first things that come to mind are abuse of alcohol, violence, and disorderly behaviour. However, this does not happen at most rock concerts; fans come solely for the purpose of enjoying the rock music of their favourite band, and while people do drink, very few actually get drunk enough to start a brawl or any other disturbance that might cause the concert to come to a halt. While it may seem like anything goes at a rock concert, there is actually a particular way of behaving at a rock concert, and certain rules which need to be kept in mind. The first thing you need to do is arrive early, in order to get a seat near the stage. If there aren’t any seats then standing near the stage should be your prime objective. If you are late, you will have to go through the entire crowd when trying to get into the hall. Do not push or shove, and stay calm - do not disturb other people, and concentrate on quickly making your way to the front. Do not be abusive to the security personnel and listen to them as they are in charge of your and the band’s security. Also listen to the management staff, as they are charged with ensuring that the equipment stays safe and there aren’t any electrical accidents. Do not drink too much, as this might lead to disorientation. You might end up falling down and hurting yourself. 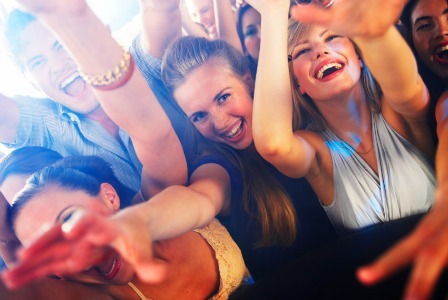 While dancing, keep your hands and legs to yourself and avoid hitting anyone else, as this could cause a fight. If you spot a girl, do not trying any groping as this is not the time or place for this sort of behaviour. Remember you are there to dance and listen to music, not get laid. If the rock band is late, do not lose your temper and just make the best of the situation. If you cannot wait too long, then it is best that you leave the area. If the event organisers do not allow alcohol, then obey this rule, or else you might be thrown out by the security. Always be polite to the people around you and try to make friends instead of enemies. However, remember that the people are there to listen to music and not to talk to you, so if you are being ignored, do not get offended. Always dress appropriately; just because the band members like to show some skin does not mean you have to do the same.